Hi! I’m back post-wedding and minimoon and I am still floating on cloud 9 ♥️ Now, back to the kitchen! 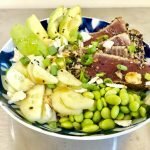 In the last 18 months, we’ve seen an explosion of poke restaurants. 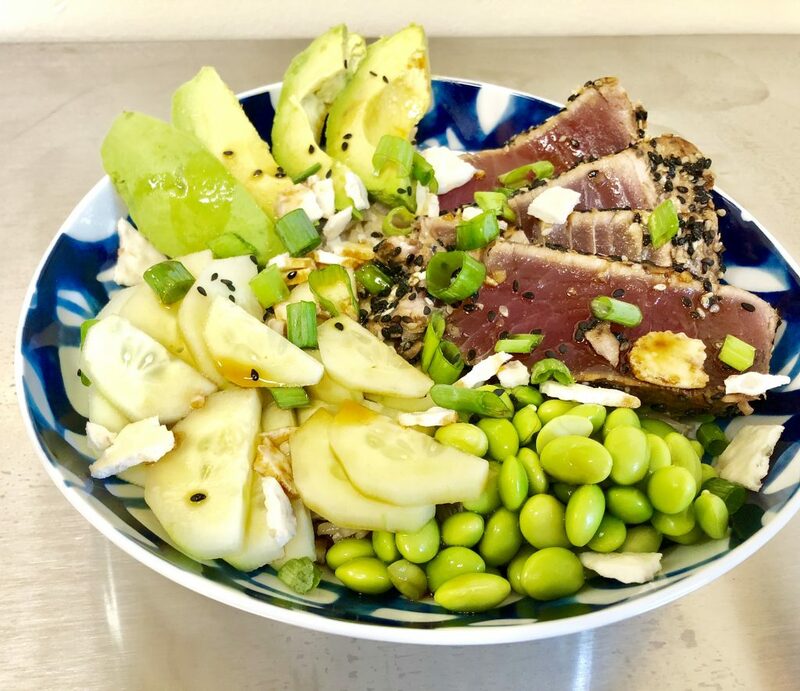 I’ve had some amazing poke bowls and some underwhelming ones, but consistently, I always feel like this is something I should be making, not buying…the high price tag was a good push into the kitchen to give this a try! 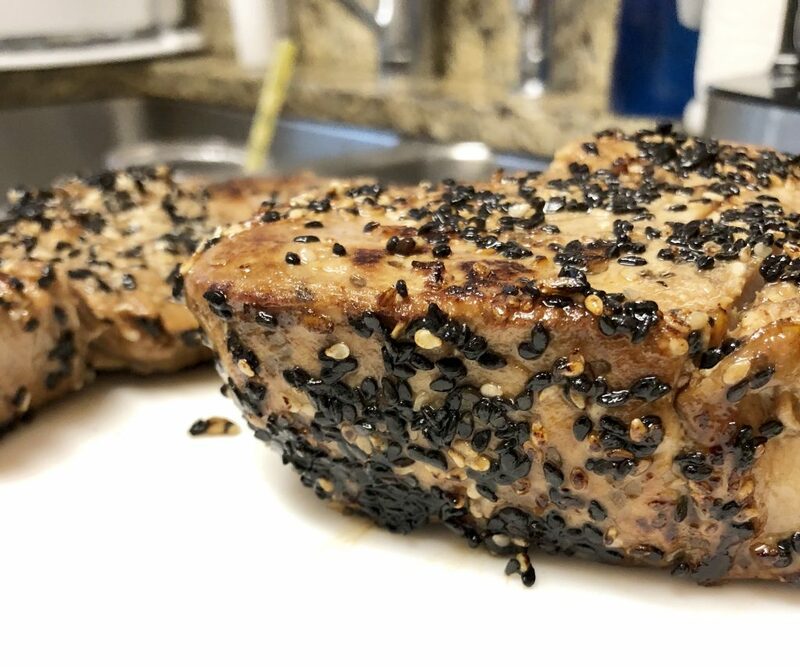 I pulled this recipe for my Sesame Crusted Seared Tuna Rice Bowl together quickly and didn’t have time to go buy sushi grade tuna, so I bought wild yellowfin tuna steaks instead and seared them up. Such a satisfying meal and rice bowls have endless customization possibilities! Combine the ingredients for the marinade in a small bowl. Add tuna steaks to a large ziploc bag and pour the marinade over the fish. 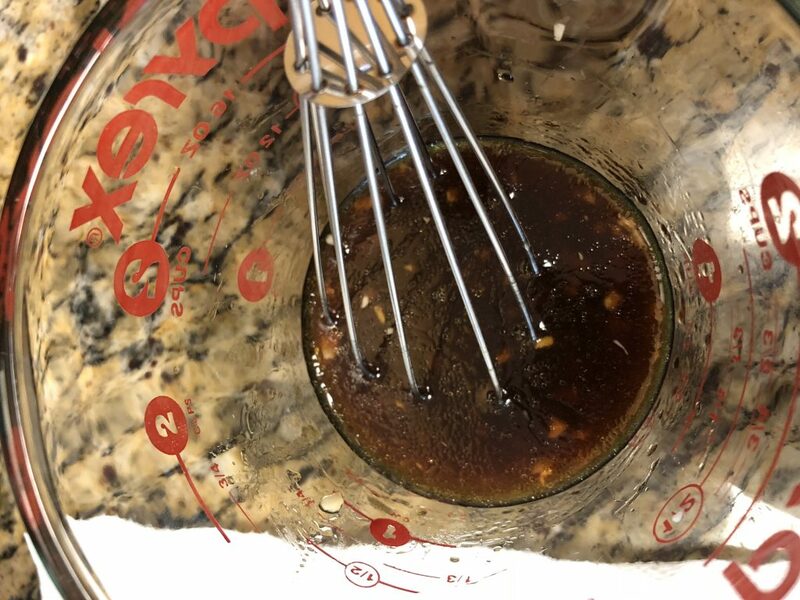 Allow to marinate in the fridge for at least 30 minutes–I like to put the fish in the marinade in the morning and then sear the fish for dinner. If you are doing a long marinade, take the fish out of the refrigerator 30 minutes prior to cooking to bring closer to room temperature. Heat the olive oil in a cast iron skillet over high heat until very hot. 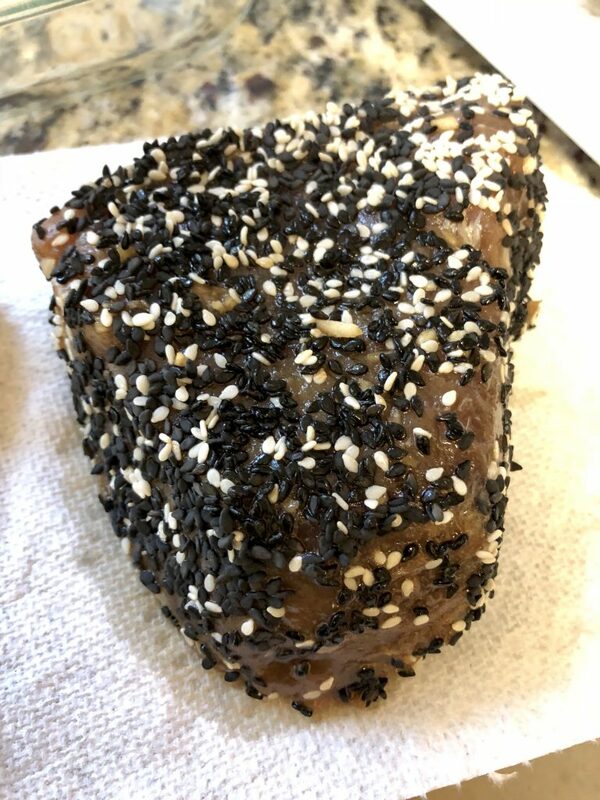 Place the sesame seeds in a wide shallow bowl or on a plate. 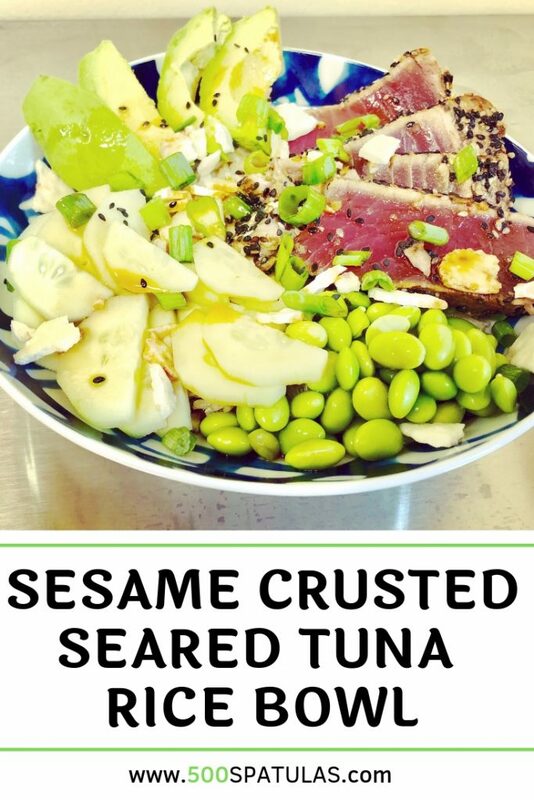 Coat the fish on all sides with sesame seeds. Place the steaks in the hot pan and sear for 30 seconds on each side. Let rest on a cutting board for 5 minutes, then slice. Now we can assemble the bowls. I like to make a rice bed and then keep the mix-ins separate on top, but that’s more for visual appeal. This is where the customization part gets fun–it’s also really easy to accommodate any picky eaters etc. Combine the ingredients for the marinade in a small bowl. Add tuna steaks to a large ziploc bag and pour the marinade over the fish. 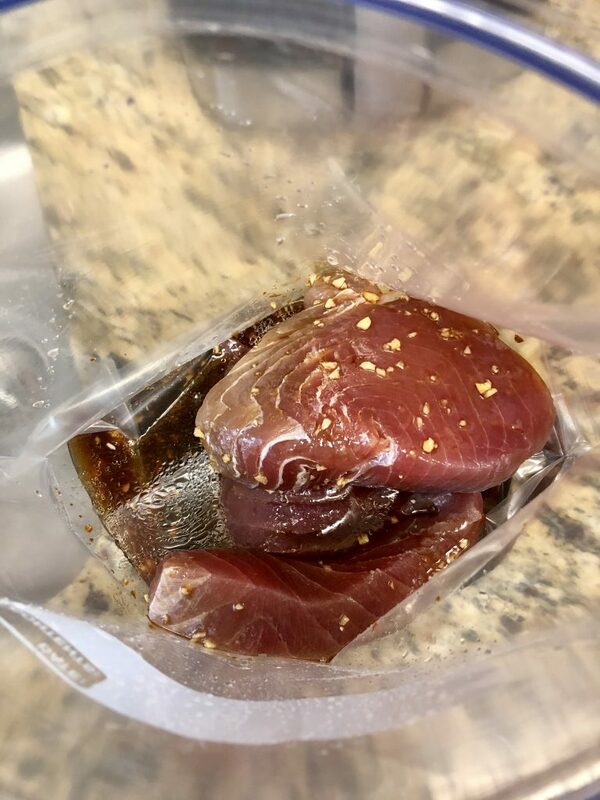 Allow to marinate in the fridge for at least 30 minutes--I like to put the fish in the marinade in the morning and then sear the fish for dinner. If you are doing a long marinade, take the fish out of the refrigerator 30 minutes prior to cooking to bring closer to room temperature. Assemble bowls. I like to make a rice bed and then keep the mix-ins separate on top, but that's more for visual appeal. Dress with the sauce and then add in your toppings and enjoy!